As I encounter some new shapes of ministry and relationship among Friends, I’ve been reflecting a lot on how our past experiences shape who we have become, and how we can be most well-used. I was diagnosed with rheumatoid arthritis at age 4. After a few weeks of a virulent flu at age 3, i never quite recovered. 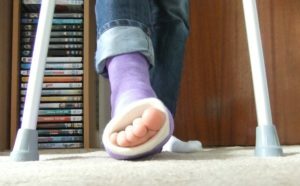 Watching home movies of me around this time show me limping, even though no one really noticed it at first. I was also diagnosed with a large (benign) bone tumor on my left leg, which had to be removed, making sure I missed most of nursery school that year. That was my first big loss for illness. The pain I was feeling was attributed to the tumor – but the joint pain stayed. Elementary school was pretty tough. I was on multiple medications – I remember Christmas (my favorite holiday of the year) being “ruined” when I had to be rushed to Boston Children’s hospital in the middle of the night for vomiting blood. Of course, I was taking almost a full bottle of St Joseph’s baby aspirin every day. I didn’t realize it was not normal to buy this product in bulk! That school year I had to come home every day after school and wear two large full-leg casts until dinner, and then sleep in them every night – to keep my legs growing straight. I couldn’t go out with friends, or play int he yard, or anything else. I read a lot – and luckily I loved to read, so I did have an escape. 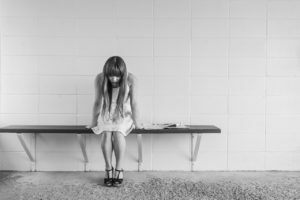 The chronic pain was especially difficult in high school. 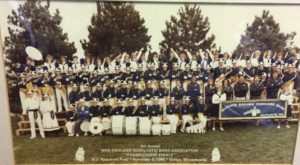 My greatest longing was to be in our award winning school marching band. 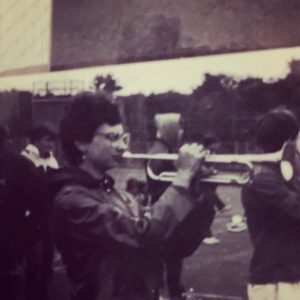 My doctors made an unbelievable compromise with my parents – I would attend all rehearsals, watch from the sidelines, and get ONE run through with the drill at the end of the day with the band. I had to hyper concentrate, and learn and take notes from the sidelines to focus on my ONE run-through. That taught me a lot about immediate focus. During that time, I was waking up every 3 hours for pain medications. The meds would last about 2.5 hours, in the day, and I’d have a half hour of mounting joint stiffness and pain 4-5 times a day. I couldn’t concentrate, and couldn’t participate in most school activities. Luckily (???) it was not at that time, hand pain. My doctors told me to make sure I attended an accessable college – they were concerned I might be in a wheelchair by the time I graduated. I ended up at Umass, and after two years as a clarinet major (which I loved) – the joint pain in my hands was became constant and unbearable. Soaking my hands in hot wax was the only way to reliably get them to move so I could play. I could no longer handle the daily practice routine. In a few weeks, I sold my clarinet, changed my major, and started essentially a whole new kind of existence at my college. My whole life had been framed by music classes and concerts – suddenly all my friends were in practice rooms and concert halls, and I was out on my own reinventing myself all over again (and dealing still with chronic pain). That first Saturday morning, sitting in the campus center – clarinet gone, friends all engaged in rehearsals, was terrible. Luckily, lots of experimental medications, and many acupuncture appointments put me in some sort of remission. After a time of working in the Amherst area as a store manager, and other odd jobs, I was able to return to music school for a last year and finish up my classes. I would go on to teach music in New York State, Massachusetts, and New Hampshire. 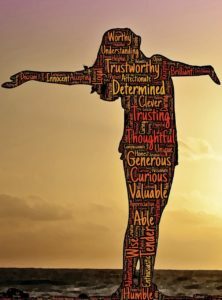 The birth of our dear daughter brought some new health challenges for me – my autoimmune challenges, which had been mostly manifested in arthritis, now spread to my thyroid. After a few years of real struggle and missed diagnosis, I finally found doctors who figured out that I all my weird debilitating symptoms were a result of Hashimoto’s Thyroiditis. I am under the care of a whole new set of doctors – but my day-to-day health is always tricky. Weird temperature fluctuations, exhaustion, brain fog, general aches and pains are common. I need 12 hours of sleep a day. I have to avoid stress if possible. Self care has never really been easy for me – and as I age, it is even more important! These struggles have shaped who I am. I have a sense of urgency around completing tasks – I wonder if that comes from never knowing if my body will no longer support finishing a project or job in the future. I often have to cancel events and plans. 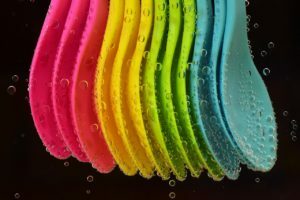 I have come to use the “spoon theory” to explain to others how I often live my life. 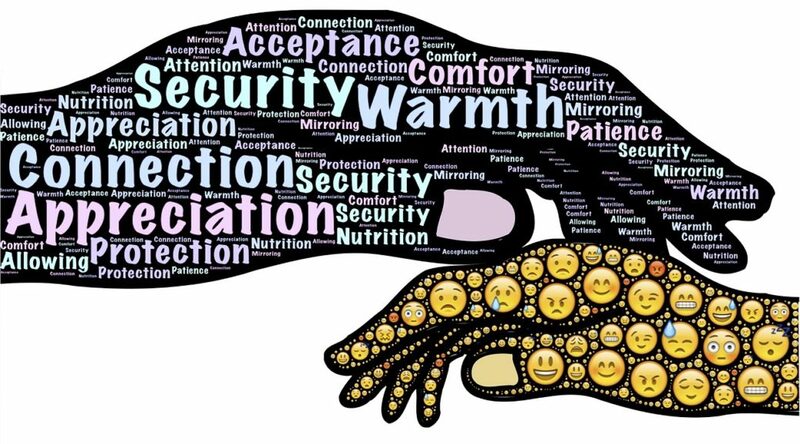 In that context – I have to be careful not to commit to things that take more “spoons” (energy) than I have to give. Prioritizing becomes a necessity. My family and being home has become a priority. How does this affect the ministry I am called to? This struggle has often put my in the place where I feel I cannot “get to” the table, or be part of the process. I can’t often stand for long periods of time on a street corner, or walk in a justice march, when even just too much time in the sun or cold can make me ill. Day long meetings, in places with temperature fluctuations or uncomfortable seating, can be hard. Last summer I was called to be present in Boston, in witness against a proposed hate rally that had been given space on the Boston Common. 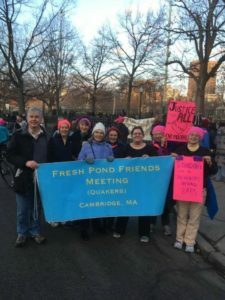 Many Quakers attended, and there was a staging area at the Beacon Hill Friends House. I chose to go – but stayed there, in the house, with others for the day. That room was filled with folks that also couldn’t walk far, or be outside, or simply be in crowds for one reason or another. They were there in prayer, and making food, and supporting in ways they could. It did seem hard – often the “rock stars” of the witness (to me) seem to be those on the stage, sharing the strong messages, being present and getting in the way for justice. I simply do not have that option or ability. Learning how to hear clearly where I am called, and do that thing, has been important for me. My call to travel among Friends often does not involve bringing a powerful message, or a specific program. More often, it’s simply listening to the quiet stories that we share, and the many ways we are invited to be faithful. It doesn’t often seem to fit in a particular “program” of travel. While that is mostly alright with me – it does seem hard sometimes not to fit into the “to do” plans and actions the world seems to require of others. I can’t separate these experiences from my current work and call – nor do I need to. I think incorporating these experiences, and seeing them in others, is part of the deeper work for me in this time.